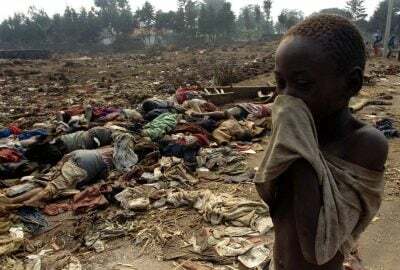 Significantly, a body of analysis and eyewitness testimony suggests that the standard account of the Rwandan genocide, painting the Hutu majority as the principal villains and the Tutsi-dominated Rwandan Patriotic Front (RPF) as the saviours who ended the genocide, is a distortion of the truth. While not absolving the Hutu extremists of their crimes, an alternative interpretation holds that the RPF forces are responsible for the deaths of hundreds of thousands themselves, including the two African presidents killed on April 6th. This is apart from the millions the RPF has had a role in killing in the Democratic Republic of Congo in the time since the genocide. As this year’s Rwandan Week of Mourning comes to an official close, we take a look at some of the facts contradicting the official Rwanda narrative, and why it matters 25 years later. Our first guest, Phil Taylor, worked as an investigator for the International Criminal Tribunal on Rwanda. In a 20 minute conversation, Taylor talks about why he believes the UN instituted body failed to prosecute Kagame and the RPF forces he led as credibly accused war criminals. Phil Taylor is host of the Taylor Report airing on CIUT 89.5 FM every Monday at 5pm Eastern Time. A long time social activist and journalist, Taylor formerly worked as an investigator for defence lawyers involved in the International Criminal Tribunal on Rwanda. Judi Rever is a Montreal based freelance print and broadcast journalist. Her reporting on Rwanda has been featured in seven front-page stories in the Globe and Mail, one of Canada’s leading national newspapers. Her 2018 book In Praise of Blood: The Crimes of the Rwandan Patriotic Front, published by Random House Canada, was a finalist for the Hilary Weston Writers’ Trust Prize for non-Fiction.